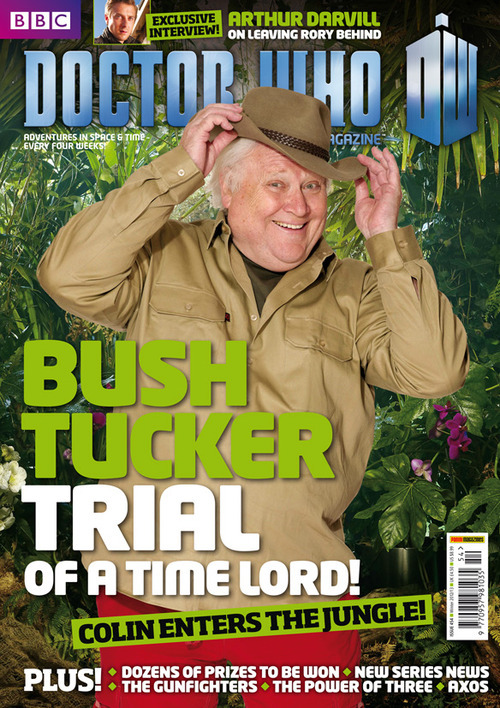 Possibly my favourite Who-related news story of the year was the 'shock' revelation that Colin Baker was going to be part of this year's 'I'm a Celebrity Get Me Out of Here'. Like a lot of these things it was a poorly kept secret. Colin did his best to hide the truth but when he was photographed at Heathrow on Monday the cat was pretty much out of the bag. Now I'm not a regular viewer of 'I'm a Celebrity' (it's not that I particularly dislike it you understand - I just can't stand Ant and/or Dec) but I really want Colin to do well here. And I really do think he can. In these sorts of programmes it's usually the people that just be themselves who do the best. Colin seems to be a 'what you see is what you get' kind of person and he's always struck me as a very likable kind of guy who does his best to get on with everyone. He's also got a big personality which should hopefully help him stand out from the crowd. I'd also like Colin to do well because this is something that I believe he has genuinely wanted to do for some time. Regular followers of his Twitter feed will know how much he enjoys his Reality TV and he's said in the past that he'd like to do I'm a Celeb. Unlike some previous contestants, Colin is no fool. He's knows exactly what he's getting into and what's expected of him so I think he'll want to make the most of the experience. I hope he gets the chance to do that. Will I be watching? Probably not. Even the promise of Colin Baker isn't enough to dilute the pain of sitting through an Ant and Dec piece to camera. But I'll keep an eye on his progress nevertheless. Good luck Colin!